Glossy is a 3 columns fixed width WordPress theme with built-in theme option. 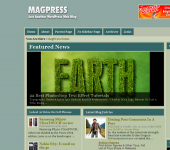 This glossy looking theme contains features such as smoothgallery, adsense ready, widgetized sidebars, etc. Hi Guys, thanks for a great theme. I use it for my site http://www.insidewomanmag.com. I just wanted to find out if I can increase the advert blog on the header to be a bit bigger than it currently is? Thanks for your help. Hai you can try adjusting the width % of #headleft and #headright inside the style.css. first of all, great theme..I’ve been using it for a while now. About the featured gallery; while it is loading it shows a full size picture and text overlay over the first post. Is there a way to make the gallery load before everything else? Because with the content I have on my main page it can take several seconds for the gallery to load, causing a not so good first impression. Also I’d like to point out that leaving out the title for any widget causes the layout to be messed up; an easy fix i found for this is to put at least a space in the title. Any ideas on the gallery would be appreciated, thanks. How do I get the featured to work? It doesn’t show on my website, how do i get it to start working, please help. Hai. You have to enable it first inside the theme option and choose a category to feature and save it. Hi, I use this theme, but my widget will show error cannot open, when I add widget or edit widget. 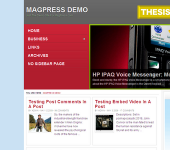 I’ using wordpress 2.8.4. Hai, Kevin. It worked fine on my side. Did you edit the code inside the sidebar.php? Please let me know what kind of item you’re trying to add inside the widget that showing error. Thanks. I noticed that you have manually deleted some of the codes and missing closing tags on the page template you’re using. Please let me know how do you want your page template to be and I’ll make it for you and send it to your email. Thanks. Hai Jen. I’ve sent you an email regarding this issue. Please check your email. Thanks. Hi, great themes. Any chance of making this theme with another color like Blustic? Well thanks for great tips, I am changing it now and will inform you results! By the way I noticed that theme is not working properly in Internet Explore browser! Will you check it? After that, you have adjust the #navigation for background blending, open style.css, look for #navigation, add background-color: #000000; on it. Open the sidebar.php, look for the div id=”sidebar-two”…/div under it there is the div class=”sideminibox”/ADVERTISEMENT CODE/div. Copy the sideminibox div wrapping the advertisement code and paste it inside div id=”sidebar-one”../div, remember to put it before the “php if dynamic sidebar” thing, so that when you use widget, it wouldn’t mess up the advertisement box..
You have to manually adjust the css styling for the search box to fit your need. Please try out the solution above..Feel free to let me know the result..Thanks. 1. First thing I want to put my 450X92 size logo instead of text ” Tech Digit – Your Ultimate Destination For Technology Needs” How can I do it? 2. I want Google Ads on Sidebar One widget instead of default side! Is it possible to do it? 3. How I can change Search Box to Google Search Box? I will be happy if you answer with possible solution!